Queen St is Auckland’s spiritual and commercial heart but it’s also one of the most unique streets in the city. For the most prominent part, the over 1km from Mayoral Dr to the harbour, there is not a single vehicle destination on the street. There are no carpark entrances, no loading docks and no lanes that cannot be accessed by another route. As such, with the exception of deliveries/couriers, any vehicle using this stretch of road is doing so to get somewhere else. Around a decade ago the old Auckland City Council started an upgrade of Queen St to make the street more people friendly. This included upgrading and widening the footpaths, the addition of double the number of pedestrian phases at intersections, mid-block crossings and a 30kph speed limit. Some short term carparking and loading bays were retained to appease retailers because at the time many of the changes were considered controversial and plans for bus lanes were dropped. The benefit of hindsight suggests the upgrade was timid and a lost opportunity, especially with the much bolder changes the city has seen over the last five years. At the time of the upgrade the council estimated there were about 46,000 pedestrians, 40,000 bus passengers and 25,000 people in vehicles. Heart of the City now have fantastic data on pedestrian numbers thanks to automated counters located around the city and they show pedestrian volumes of around 60,000 per day, sometimes more. For example, on Friday 1 April the counter outside 210 Queen St (eastern side) recorded 36,128 people passing by. I’ve long wanted to see what impact the upgrade had on vehicle numbers but amazingly it appears no traffic counts had taken place since 2004 (it’s so old the data isn’t on ATs public Traffic Counts spreadsheets but I have an old copy). That changed last week after AT finally conducted one and were kind enough to share the results and there is a fascinating amount of detail. The count was from Wednesday 16th March to Tuesday 22 March and was taken between Victoria and Darby Streets. It’s also worth noting that the results from March may have been affected by diversion of traffic as a result of CRL enabling works. 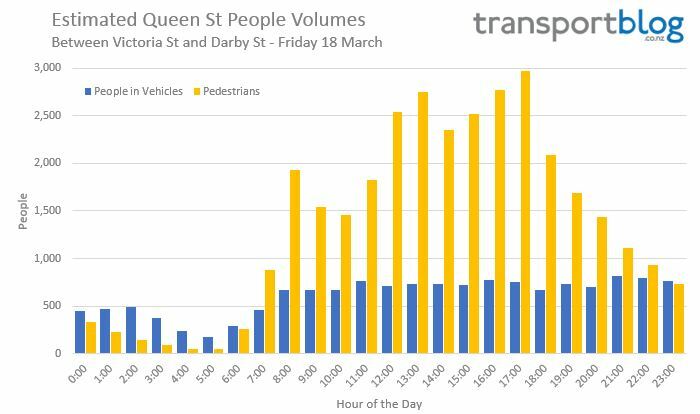 Back in 2004 in the same spot and almost exactly the same day (14 Mar – 20 Mar) the counters recorded an average of 10,300 vehicles using Queen St in each direction over a seven-day period. By comparison counts this March show vehicle volumes are down 48% to an average just 5,300 per direction per day, far more than the predicted 15% reduction in volumes. The new data is such that it can be broken down to 15 minute intervals for each direction for each of the seven days. The busiest single hour for either direction was on the Friday 18 March at 16:45-17:45 when 401 vehicles were counted travelling southbound. Remember though that this is over two lanes so that suggests even at its busiest, Queen St is moving just 200 vehicles per hour per lane. The graph below shows the average volumes over the week although I’ve just kept it hourly so it stays readable. 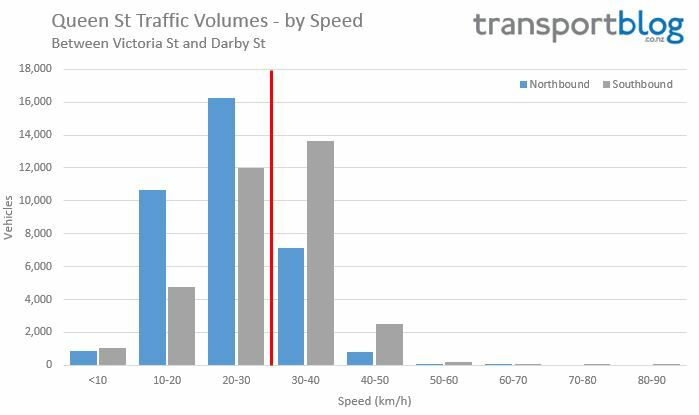 As mentioned earlier, lowering the speed limit on Queen St to 30kph was one of the changes made as part of the upgrade. Included in the data is a breakdown of vehicle speeds. For vehicles traveling northbound, 22.3% (7,971) exceeded the speed limit while the 85th percentile speed was 31.5kph. The numbers for those going southbound are quite different though with 47.8% (16,312) exceeding the speed limit and the 85th percentile was higher at 37kph. The most extreme speed captured was one vehicle on the Saturday afternoon that was recorded travelling southbound 80-90kph – another four at other times were 70-80kph. The speeds are shown on the graph below with the red line indicating the speed limit. The data also gives a breakdown by vehicle classification. In total 91.9% of all vehicles were classified as cars or light commercial vehicles while 7.3% were classified as medium or heavy commercial vehicles. I’m not sure what the other 0.8% is made up of, I’m assuming they couldn’t be classified properly (I’m sure some of you engineer types can tell me what CL14 is). One thing the data really does highlight is the spatial differences between modes. In this part of Queen St the corridor is around 27.5m wide. Of that the four lanes of the road take up 12.8m (47%) while the footpaths on each side are each around 5m wide. The remainder of the space is split between carparks and seating/trees/bus stops as can be seen in the first picture. Using an average occupancy of 1.2 people per vehicle it suggests that more than four times the number of people are walking down Queen St than are in vehicles. It also suggests that based on the width dedicated to each mode, that each metre for vehicles is moving around 1,100 people per day while each metre of footpath is moving almost 6,000 people per day. Using the data available and the vehicle occupancy suggested above, I’ve put the graph below together to highlight the difference between people in vehicles and people on foot. It compares the volumes on a Friday which will be why the volumes remain fairly high at night. 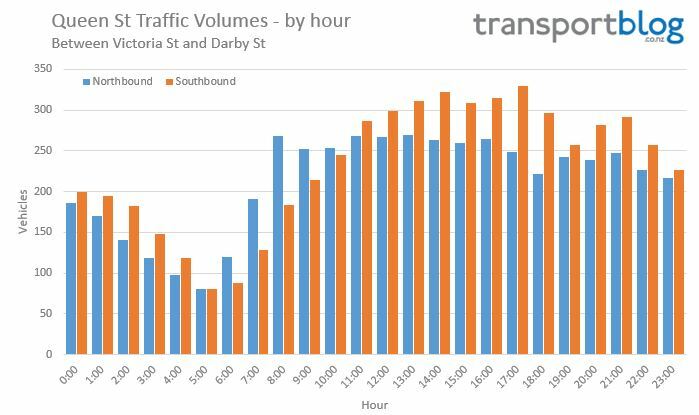 The big unknown is the impact that public transport has on Queen St. The CityLink buses run every 7-8 minutes for most of the day and are often very full. The numbers being moved by bus along Queen St could be much higher than all other vehicles combined. I’m sure AT could easily pull the information from the HOP system. The bus lanes that are soon to be installed on some sections of Queen St are not only well overdue but given the number of PT users be a much fairer and more rational use of the space. 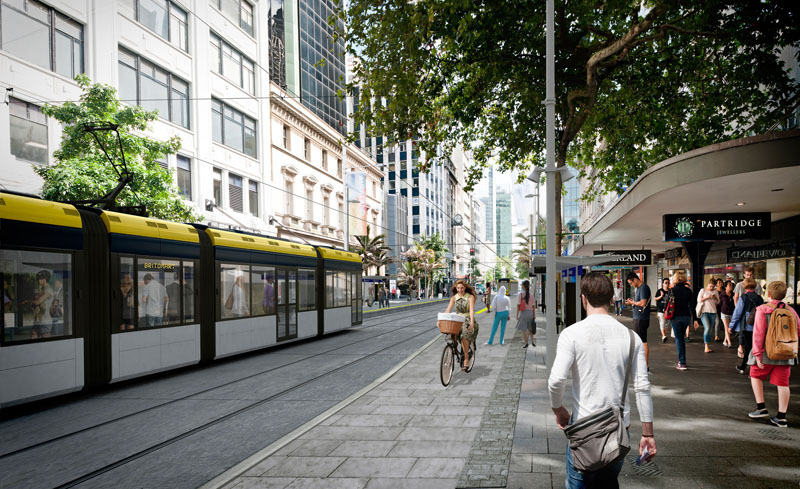 If AT’s light rail plans go ahead Queen St will be transformed into a transit mall which will be fantastic for both PT users and for pedestrians as it will mean dedicated space for PT and more space will be able to be allocated to pedestrians (and hopefully cyclists too). Lastly while looking for some information on the Queen St upgrade for this post, I came across the links below which make for interesting reading. This one explaining the proposals includes Heart of the City calling for parking subsidies for visitors while the AA call slower speeds and bus lanes “very sensible and reasonable”. A selection of comments to the Herald on the proposals. Most are fairly supportive of a people only space or a transit mall type situation but there are a few doozies in there. So few commercial vehicles, they won’t be hard to accommodate once the private vehicles have vanished. So half way there in over a decade; the next step, after the buslanes, is to remove right-hand turns from the Victoria and Wellesley intersections on Queen. Improving the remaining cycles, and enabling the lanes to be rationalised. Then the long overdue closure of the bottom of Shortland St to traffic, the parking garages there are at the top of the street, and drivers will soon get used to coming and going this way only. Traffic through Queen/Wyndham too is unnecessary. I think the biggest challenge for completely opening Queen St is the role of taxis, and the new class of taxi services that are indistinguishable from private cars. These provide an important service especially for people with mobility issues, yet quickly become a nuisance wherever they get access. Maybe the shared streets can become delivery/taxi only? That still leaves the problem of is an uber driver a private vehicle or not? This also raises an important issue for the city; we had better sort out where we want private car access and where not soon, before there are a plague of bot-cars with their masters demanding total control of our streets…. It is more important to get the city right than to fantasise about the possibilities of future vehicle technologies. Technology obsession is a distraction from the less glamorous and more contested business of city-fixing. I don’t see why mobility is an issue. If someone has mobility challenges how do they get to that shop in the middle of a Westfield mall? As long as there is mobility parking along the edge’s that should be fine – and outside event venues such as Aotea Centre, Q Theatre etc. Plus I have been in pedestrian only areas in some of the old cities in the UK such as Canterbury and I don’t recall any mobility parking in the middle of these small narrow cobble stone areas which can be quite large areas. Taxi’s should simply be banned just like everyone else. The answer Adam W is that someone with mobility issues does not get to that shop in the middle of the mall. In fact life is painfully full of places you don’t have access to. It takes no time to wonder why there are no mobility impaired users in the brochureware. The reality is the lower half of Queen Street has become more inaccessible and you have to park illegally to provide access to loved ones so they can go to work, or participate in any activities on Queen Street. As is stands the designs only promote less accessibility to those who are being ostracized on a day to day basis. But then again that is the standard being promoted on this blog right. Less accessibility for mobility vehicles and users. I dare you to find a public mobility park within 50m of your favourite lower Queen Street shop that has no inclined roads between it and the destination. Even the ferry building and Quay street are becoming less accessible. Even better will be closing Fort Street exit to Queen Street so it can become a real shared space. Right now it is a parking lot and rat run, especially for courier and taxi drivers. I have seen them beeping and cursing people for not moving. I have also seen cars driven at 50km/h+ through there. Fort Street is succeeding despite the way it is set out, not because of it. Or one way it *away* from Queen St. So you mean cars could only enter from Queen Street? I am not sure I understand. To start with yes, i.e. flip the sign over tomorrow. No more queues backing up the length of Fort St. In the longer term you’d close the Queen St side completely and just have an almost pedestrianised shared space, with no reason to drive except get in and out of that one building’s basement or maybe park your courier van for a few minutes. My view is that Taxi’s are the licensed operators, with the identification, legislation and regulations enacted to ensure compliance with a range of things, including signage. Uber and similar services are analogous to the minicabs of London, who are a less regulated version. The more regulated version, that can easily be identified for transgressions should be allowed access to PT spaces, although they need to comply with the appropriate rules, or the privilege should be revoked as was done with Grafton Bridge. If the data was available it would also be interesting to know how the increased foot traffic has affected retail as well. The stores in Queen St used to be such that you wouldn’t go out of you way to shop there as the malls were better. But now there are a lot of new retailers and far more different overseas chains arriving which gives a boost to Queen St. Have they come because of the increased foot traffic or just because we’re growing up in a nice way. It’s really great to see as the city was dead for years. Gone were the days of John Courts and other big stores but now it’s starting to look more vibrant like that again which is great! Hopefully this will encourage the powers that be to pedestrianise the area more fully and bring even more people into our beautiful city. See truecommercial.nzherald.co.nz/download/13007 – Queen St retail rents saw pretty steady growth until the recession hit, a bit of a dip and then slower increases in 2010-2014. They then had incredibly strong growth in the last year – almost 40%. That latest repricing reflects the international retailers moving in and paying top dollar to do so. Even ignoring that, those rent increases after 2007 would compare very well with any other shopping precinct in NZ. 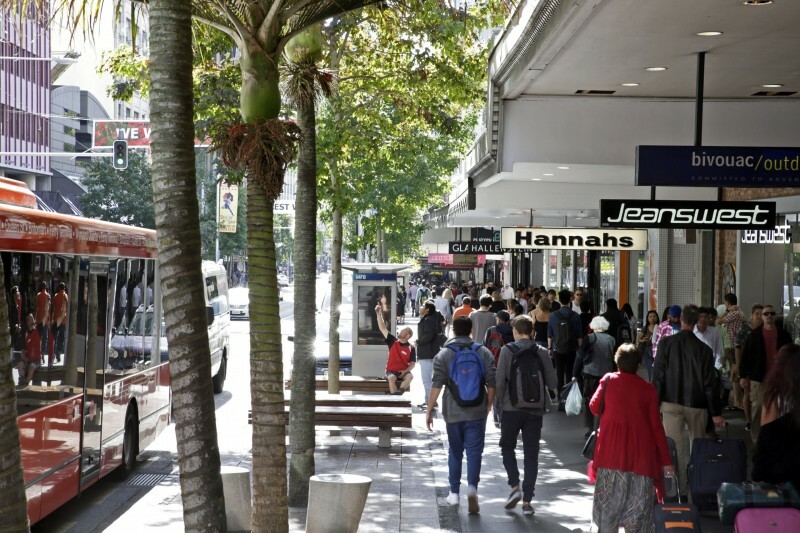 It won’t all be due to the street upgrade, but Queen St wouldn’t be as successful as it is today if those footpaths hadn’t been widened – it simply couldn’t accommodate as many people. As a participant in the debate I recall the trenchant opposition to removal of car parking in Queen Street from a handful of retailers. You are correct that there is no meaningful destination in Queen Street (below Mayoral Drive) for any private car but overlooks that many of the vehicles in Queen Street are driven by young people cruising the strip (see and be seen) – if you wait at any given point long enough (say sitting at a cafe table) you will probably see a few distinctive cars (and occupants) loop around again. My suggested solution is to trial blocking off a short section of the road (it could be only a few metres) to private vehicles (including delivery vehicles) so that it is literally impossible to drive the length of the road but there is still access for vehicles with a genuine purpose for being there, This would remove the cruisers and other through traffic at a stroke though there would still be some making short connections (e.g. Wakefield to Wellesley). Buses/light rail and emergency vehicles (and possibly taxis) would not be affected. I don’t see why council hasnt just done it already on a trial basis. Take away parking and private vehicles for a year and see how retail does. Based on overseas experience it should be a no brainer. It’s clear from the data above and simple observation of the improvement in both quality and variety of retail on Queen St that there is no relationship between vehicle volumes and retail success. The key metric is pedestrians, people on foot being after all, the only relevant force in this issue, no matter what some retailers may believe. It really is time for Council and AT to stop pretending that this argument is anything other than entirely laughable, and to give it no head. It is time to be grown up about this. The peak vehicle flow is at the commuter rush period and is cross town, east-west, using parts of Queen as a rat run. The city will be considerably improved when Queen is designed for these users Pedestrian, Buses north-south, and vehicles east-west. It seems your “on foot” equals revenue logic has a significant flaw to it. Many of those people on foot drove and parked, bused and trained into the area to get there. By the numbers you should also be including the usage of every parking building within walking distance. By adding those numbers means your data actually suggests most people travel there by vehicle. Also since cyclists can already use the roads and pavements to travel there is no data to support a significant uplift in cyclists. dun dun dunn. (Nice use of the non referenced graphic btw, I may feel like having a go with paint.net to create a similar also poorly referenced one later. Or did you actually put in the money to use photoshop, because you know you could have spent that extra effort to include a reference on a basic text file and it would be more valid). Why is that flawed? It just shows that walking is more efficient, or in other words it suggests we should give more room to space hungry modes because they are space hungry. My stretch limo needs five carparks because its a stretch limo. On the speed issue, I wonder if walking isn’t the fastest already. I used to commute from the top of Queen St and walking was usually faster than catching the bus, likewise I expect it is faster than driving if you factor in the time needed to get your car and park it again. (incidentally, I’ve been timing how long it takes me to get in or out of a carparking building, from being at the entrance on foot to being on the road in car. The average is around 8 or 9 minutes in the city, about the average wait time for a bus!). It’s one thing always notice with people when they drive, they assume once they arrive in the vicinity of their destination, the trip in their head is complete. The time to park and then walk from there to their actual destination is not really part of the journey. Especially when “helpful” people offer to drive me so I am not exposed to the horrors of PT or cycling. Yeah, no thanks. I would rather wait for the train/bus than walk to the parking building and then wait at lights until we finally get moving. One of the many things I love about cycling is the ability to pull straight up to the destination, quickly lock my bike and away I go. Heh, I love the look of surprised horror when I tell those ‘helpful’ people “no thanks, I’m in a rush so I’ll take the bus”. Anecdotally, walking is faster than cycling up it – I once ‘raced’ a rather handsome sailor up Queen Street, he was on foot, I was on my bike. He beat me easily as I had to stop so often at all the red lights. If you get off your bike at each intersection you can legally walk it through the pedestrian phase 🙂 Best of both worlds. It’s a very flawed approach. If road space were allocated on the basis of ‘metres per person per day’ it would be almost impossible to justify a cycle lane…..E.g. assuming one person per car, cycling numbers would to be at least half the car numbers to justify the 1.5 – 1.8m cycle lane width – Do we have any roads where cycling numbers are 50% of vehicle numbers? Or looking at it another way cycle lanes would end up being about 300mm wide and restricted to very slim people with very narrow handlebars…. Nick nonsense; cycle lanes have much higher capacity than general traffic lanes. At best a car lane can get up to 2000 people per hour, cycle lanes can do 14,000, and note these traffic lanes are only carrying 200 per hour. An incredibly inefficient use of space. Especially compared to walking or cycling across the same width of public realm. So to move 100 people from Moscow to Vladivostok, a bicycle lane will be more efficient than a road? @EarlyCommuter, The graphic Patrick showed clearly states that is depends on speed as well as a bunch of other factors. Because the most relevant comparison to the most intensely used mile of road in New Zealand is obviously a 9,000km journey across the frozen interior of a continent. Early I think you need a big sleep in. It’s perfectly clear we are discussing intra-city travel not inter-city travel, let alone trans-continental. The post is about as about as urban a place as we have in this country, with a current speed limit of 30kph, that is more place than route, in no way comparable to travelling across time zones. Additionally, while we all love an international perspective, your obsession with Russia, or indeed the long gone Soviet Union, strains for relevance whenever you bring it up. The New Wales roads authority (RMS) did exactly this in Sydney. They found one CBD bi-directional cycle lane that is about the width of a vehicle lane moves more people per hour than the adjacent vehicle lane. The road is not a major arterial but still has plenty of cars using it. It goes without saying that each of those riders consumed much less space than their motorist counterpart. Sydney is far from bicycle friendly. It just goes to show that it doesn’t take much to get a higher throughput of people with bicycles compared to cars. The irony is the pro-roads and anti-cyclist RMS hid this information that was collected using taxpayers money. A savvy Sydney Morning Herald reporter had to extract it using freedom of informaton reuqests. Speed is completely irrelevant, the people walking are able to stop and shop and most of them are there doing just that, the cars are simply passing through. Passing through is of no value to Queen Street and these commuters or rat runners could do their passing through somewhere else. The idea that speed or LOS is at all relevant here is simply to see all roads as merely pipes to get through quickly, rather than seeing the urban environment as a destination and somewhere to be in and of itself. Roads aren’t parks. Or boulevards. If we want parks and boulevards, let’s build parks and boulevards. We expect parks to be the best parks around, not decent parks and acceptable roads. We should demand the same from roads. Doesn’t mean you can’t change a purpose of a public space when circumstances change. Good thing Queen St is a street and not a road eh! This is a street not a road, anyway, just one that has been copied by motordom and we are taking it back. Anyway, all the time you spend on this blog, Early, you don’t seem to take much in; do you perhaps not read the posts at all; just your own comments? Speaking of improving access for people, I understand that Christchurch has implemented a 30km/h zone in their downtown. Queen is already 30kph, is discussed in the post above. + me I agree for the whole of the CBD. See the comment on the TomTom congestion, would reduced speed limit increase the flow? Queen St certainly is a delight to walk up and down these days, always so busy and full of life. It can be painfully slow trying to take the red link bus up it though, you wonder how bus lanes would have made a difference there. It also shows those whinging about the effects of reducing car convenience are likely the ones who have profited from the changes (the shop owners). We have a similar debate about Broadway down in Palmerston North, and I believe student two years above me did research on it. Worth writing a guest post about for comparison maybe?? Cycling down Queen street on Saturday night, I noticed that the road markings on both sides of the road between lanes had been changed – There is now a combination of dashed (after intersections) and solid (mid block) white lines; Im pretty sure these can only be for bus lanes. Yes bus lanes on the lower two blocks are coming very soon. They peter out at Victoria St, no idea why they aren’t to continue to Mayroal Dr, but perhaps it’s an incremental strategy…? We don’t want to rush these things. The most important thing is that the misguided views of the noisy minority are given priority to stop change for as long as possible. The ones that we are getting are so dispersed and broken due to the allowance of cars to use them at every intersection as to be almost pointless, and the general lack of enforcement of bus lanes means they are going to be ignored in any case. As planned, the bus lanes couldn’t be more clear in their intent to absolutely minimise any effect on cars, rather than being planned to maximise PT’s ablity to be useful – on time and rapid – in this area. The data in this post just makes it even more clear how AT’s focus remains on private cars regardless of the mode share. Reminds me of their comments on Shortland Street and elsewhere – either they state that there are too few pedestrians for a zebra, or they state that there are too many pedestrians for a zebra and hence will slow down cars too much. Above you’ll see that southbound the Bus lane is only from just before Fort St to Durham Street, so really only one block. Northbound is marginally better. Why don’t they go further south? Are they a good idea or not? If so, do them properly. They could at least close Durham Lane West where it joins Queen St, up to Durham Lane. Weirdly, the bus turning lane from Customs into Queen has been painted into a median, rather than a green bus lane as per the design. AT lacks vision and is confused; they promote the use of PT but simultaneously advertise cheap car parking (subsidised by the ratepayer to keep car parking charges low across the CBD). Bus lanes up the length of Queen Street is a no brainer (along with pre-emptive signals at the lights to keep the buses moving). I thought those were great, to see how far we’ve come since then (although listening to some folks today, they still have the same opinions. Like the guy who lives in Whangarei and wants the CBD organised so he can drive from Upper Queen St down into Queen St on his once a year holiday! WTF!). AT should take this opportunity for road works, evdienced based research, to progressively start transforming queen st into transit mall insteading of waiting for LRT. Does anyone have the link/info/knowledge of whether that study was done in the end, even though years ago (mentioned in the 3rd Herald link)? Probably not because the money ended up in Alex Swney‘s bank account instead of being used for its intended purpose. 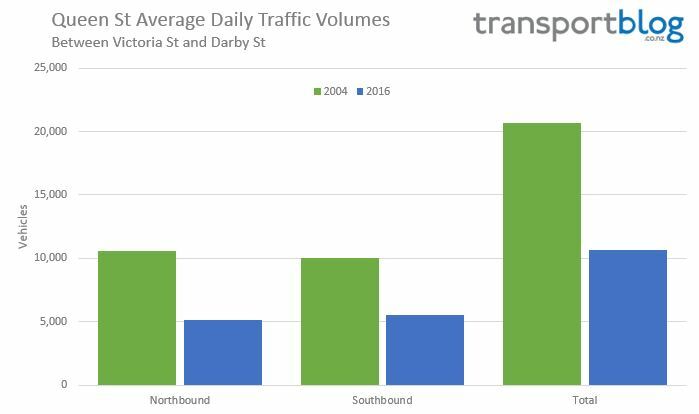 And even it it was to hand, the relationship today between numbers of people using cars and buses on Queen St is the most important. (albeit, the earlier study could show the rate of change between these over time). The fact that buses carry way more people than the cars has been apparent for quite some time, and I’m sure AT know this. I drive on queen street every day, but only across it (at Wellesley). I actually cannot remember the last time i travelled north/south along it. I wouldn’t mind at all if they closed it to cars, so long as they allow vehicles to cross it.. similar to how Martin place works in Sydney. Ironically I drove up it until Mayoral Drive the other day because it was quicker than waiting in the queue going up Victoria Street. Although that’s mostly because of the CRL works causing a bit of congestion at the Albert Street intersection so it’s a temporary issue. I know that would mean the end of our much loved Barnes Dances, but with this highly simplified structure there would always be a ped route open whenever anyone approached an intersection on foot, and as many are crossing diagonally many would never needing to stop walking at all…. I’m no expert on calculating the resultant throughput but intuitively that feels like a winner for all modes and directions. I’ll model it after work one night and do a guest post if you want? DM me on twitter? Not only Martin Place, most of Gerorge Street is closed for works on the Light Rail installation, buses have been re-routed and they are unlikely to return, although works will continue until the LRT opening in 2019. Last year there were stalls, chairs and people across the road during the few weeks up to Christmas and I believe it was a positive effect on retailers. Melbourne’s CBD retail is certainly like this. In this way it has decoupled from parking provision. When Melbourne’s DFO shopping centre opened next to Southern Cross station, the shopping centre was crowded but the car park virtually empty. Its owners had find a new market for the car park, which now advertises event and all day early bird parking. Yes exactly. If your retail offer is built around auto access you’d have rocks in your head to be in the city, you’d be at a suburban mall. And while malls go out of their way to simulate a city street experience once inside [only with no grit or authenticity] it is suicide for a real city centre to try to compete with suburban centres for driver convenience, as all that car access kills the intensity that the city offers, and, of course the particular non-maleness of the whole thing. The Unique Selling Point of city centre is the individuality of the retail offer with all the equally singular cultural and entertainment attractions that no Westgate nor Botany will ever have – but hey; free parking! K Rd was Auckland’s premier retail strip pre motorway, especially for fashion, believe it or not. And once the motorway came cutting it off from its customer base, both literally and through the removal of the trams, no amount of added car parking buildings could keep it alive. And now its future is at last looking even better as the streets get further calmed and the CRL returns a quality transit station there and the next year the Copenhagen Bike lanes are added too…. – Plenty of private hire vehicles either plying for hire, making there way to a specific drop off / pick up point, making a slow exit with passengers they just picked up. – Private vehicles picking up friends, partners, kids etc (generally easier to do on queen street than the perpendicular streets the way they are configured. Of course everything here could be catered for elsewhere. Taxi’s especially will flood, and cruise whatever areas they are legally allowed, that they think they will get the most fares. Plenty of shoppers come to the CBD, Purely because of the differentiated shops available. i.e. the only Topshop in NZ, only Louis Vuitton in Auckland etc. People will get to where is popular and hot. Think Wynyard quarter and Ponsonby road, Both lack easy & free parking, both are doing well. Don’t underestimate the number of people who get dropped off to and picked up from the city in private (boyfriend etc) cars (especially around uni). Uber has driven down the cost, and up the convenience (no need for a payment transaction at your destination) of private hire / taxi transport. Young urban professionals are working out corporate types have known for years. Getting dropped off outside your destination is way more convenient than driving six laps up a carparking building, then walking a coupple of blocks to your destination (especially for females who enjoy wearing fashionable but impractical footwear).